Have you ever seen the dragon with the rocket on a back? No? Then we will show it to you! He wants to fly and you must help him. Collect eggs and upgrade him. Avoid everything that can hurt this curious dragon. Vanquish this amazing game! This cute dragon is waiting for you! He wants to fly, but using a real rocket on his back! Are you able to help him? 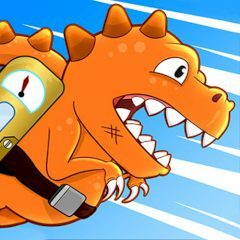 Use the rocket and fly through the obstacles. These could be lights, birds and many others dangerous things. What could be better? Fly your way as far as you can and collect as many eggs as possible. They will help you to upgrade the dragon and his power. Use your eggs to buy bonuses and a new dinosaur! Are you ready for such an amazing challenge? Then do not waste your time and start it now!